A Few Ways to Lower Business Taxes. Rhonda Abrams is widely regarded as one of the most respected experts on business planning, startups, entrepreneurship, and small business in the US. She writes the entrepreneurship/small business column for USA Today and is a bestselling author and public speaker. 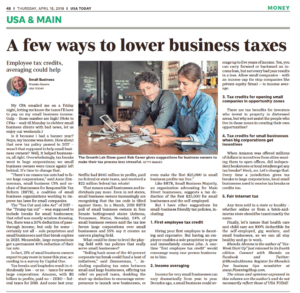 Employee tax credits, averaging could help. Look into first employee tax credit, income averaging, tax credits for opening small companies in opportunity zones, tax credits for small businesses when big corporations get incentives, and fair internet tax. The West Virginia Collegiate Business Plan Competition affords college students around the state the unique opportunity to make a business idea come to life with the support of state institutions of higher education and seasoned business professionals from around the country. 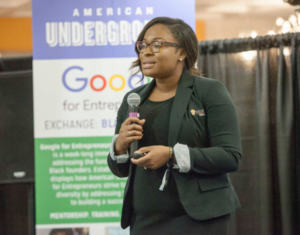 The goal of the competition is to provide students with the education, skills, contacts, and motivation necessary to create a viable start-up company in West Virginia. Three grand prize packages consisting of $10,000 cash and consulting services are awarded to the top team in each category. The competition is free to enter. The WVU LaunchLab Network was recognized on the global stage as an Outstanding Emerging Entrepreneurship Center at the Global Consortium for Entrepreneurship Center’s annual conference in Chicago, Illinois on Oct. 21. Awarded as a top finalist for having a clearly defined target audience and purpose as a center that has been open for five years or less, the LaunchLab Network received recognition for championing its exceptional engagement with students and community members, encouragement of cross-departmental collaboration and ability to raise funds that support clients’ innovative ideas. Since WVU LaunchLab Network’s inception in 2014, more than 660 venture ideas have passed through the center’s doors, nearly $90,000 in funding have been awarded to clients for innovation development and its female clientele has increased by 77 percent over the last two years. Success has also expanded to the Beckley campus LaunchLab and a third location is slated to open in 2019. The award winners were selected through a rigorous nomination and evaluation process undergoing review by a panel of 35 academic peers. More than 100 university programs were nominated this year among the 250+ GCEC worldwide membership. Other finalists included: The Entrepreneurship Center of the Federal University of Itajuba; the Jill Ker Conway Innovation and Entrepreneurship Center at Smith College; the Sydney School of Entrepreneurship; the Wond’ry at Vanderbilt University; and the Apex Center for Entrepreneurs at Virginia Tech. West Virginia University’s LaunchLab Network serves as a comprehensive, one-stop shop to help students develop and commercialize their ideas, innovations, inventions or business models. In a motivating and supportive environment, the LaunchLab Network is an applied innovation center offers hands-on idea development support, education, mentorship, prototyping facilities, resources and connections to empower entrepreneurs across West Virginia. We will report on the contestants, the launch lab, and the WVU program in the coming days post visit. Stay tune for information on one of better entrepreneurship program in the country! Generation Z is beginning to make its way into the workforce and they are confident, strong and are ready to make significant changes in the world. Are you a young entrepreneur or do you know of one right now? Over the past year, I’ve met various numbers of young people who chose to go the entrepreneurial route after high school rather than attend college. I’ve seen students come right out of graduation with unparalleled passion and ideas about building a business. These young entrepreneurs are leading the way toward an economic future that has yet to be seen. Although building a business at a young age is exciting, I’ve seen some critical mistakes in this space. Here are five mistakes young entrepreneurs tend to make along with some tips that can benefit you and your startup. Many startups run into this problem because they can’t ever seem to define themselves and what they offer. You have to try and zone in on and focus on the most critical product or service that you know will sell. When you move around too much, change your business goals, and constantly pivot, you’re not in startup mode-you’re in brainstorming mode. Don’t build a business in hopes that something will suddenly catch on with your potential clients. You may have a great idea, but you must understand the needs of the market and how you can solve those problems. You don’t know who your audience is and you’re not sure if they even exist. If you haven’t done any market research or you’re not sure if your product or service solves a problem, you will run into brick walls. You must do your research, get out there and talk to people so you can understand and appreciate what the market will buy and what they won’t buy respectively. Take time, send out surveys, and share your ideas with others. Don’t worry about sharing your ideas because most people will never put the work into seriously building a business. Share your ideas with trusted family, friends and mentors to garner important feedback. If you grew up online, you’re most likely not using social media for business purposes. If you’re a young business owner, you probably spend a great deal of time online using social media apps for communication, sharing personal updates, and posting pictures. However, using these applications doesn’t mean you know how to use them for business. Using social media for business is significantly different than using it for personal communication. You must understand how to keep each world in its own space. Go back through all of your social media accounts and make sure to remove anything unflattering. Your digital footprint can have a critical impact on you and your business. Keep your new online presence professional, get rid of any inappropriate images, and begin building your new business profile through platforms such as LinkedIn. Having a mentor in the business world is one of the most important things for a startup. A successful business mentor can guide, teach and support you. Also, this person can help you learn how and when to take risks, provide critical business guidance and feedback as well as support your mental health. Building a business is not for the faint of heart, and it is critical that you have a strong support system. There is a tremendous amount to learn about business and having the right person support you can make all the difference. If you have financial back up for at least a year, it is in your best interest to get out there and take that chance. I have spoken with many people who have wanted to leap into the world of entrepreneurship but never had the opportunity, were too scared or found they were too late for the game. If you have the opportunity, financial backing, and support — taking this risk can change your life forever. EDITOR: Have the opportunity and use lean, evidenced-based entrepreneurship, and it WILL change your life. From Forbes and Daily Medium by Robyn D. Shulman, LinkedIn’s No. 1 Top Voice in Education, 2018. Although better solutions tend to come from iteration, it can often be a counter-intuitive way to work in large-scale development projects. Not because those who work in the sector don’t see or believe in its benefit, but because the processes and requirements (often imposed by donors) that shape how these projects are delivered, do not accommodate iteration easily. Too easily ‘the pilot’ (the opportunity to experiment and learn so that you can adjust before you actually begin) that marks the outset of a new intervention blurs into the main program without the benefit and rigor of real iteration. Why? Because typically funding is secured for the delivery of a predetermined set of outcomes described in a particular way against a budget that is already planned and approved. Promises are made to do something specific which becomes hard to change, or maybe even scary to do because there were things you didn’t know when you started. For example, it is hard to apply for funding without providing detailed budgets, staffing plans and metrics. What happens when you get into it and all those assumptions are wrong? Even when it is hard to do, iteration is vital for realizing impact. Our own experiences have shown the power of iteration and how overcoming the fear to iterate can result in unexpected, better solutions. 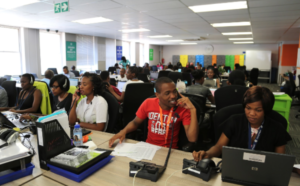 Harambee Youth Employment Accelerator works to place South African youth from poor households who are excluded from the labor market into a first job. When we were in the pilot phase, Harambee used the same assessments that employers were using (testing math and English) to determine the match of youth to different types of jobs. Unsurprisingly, the results were disappointing across the board as they reflected what was already known – young people with poor quality schooling would do badly on tests that only measured their math and English. We had to pivot, and quickly. Rather than test only for school-based knowledge, we shifted to measuring the ‘learning potential’ of a young person – their capacity to acquire new information and apply it to solve problems. The result of this shift was remarkable and completely changed our model. We found that nearly 75% of young people who had low numeracy scores actually demonstrated the learning potential needed to do an entry-level job. We shifted our processes to focus on assessments that include – not exclude – and worked with employers to change their practices as well. And we have not stopped iterating in this space – constantly adding, removing, and pivoting to include more young people. These kinds of changes meant we had to also bring our funders and other partners along on the journey. We had promised one set of deliverables and found ourselves delivering something else. The key was to help everyone see that we had to stay in love with the problem, not the solution we put into the grant proposal. Being very proactive with funders about why a current solution is not working and what new learnings are emerging from iteration is the key to keeping everyone’s expectations aligned at every step of the way. Iteration can sometimes produce unexpected insights. In the early days, we kept trying different interventions to ensure that young people who had traveled to take the job assessments would do well. After a few different attempts, we discovered that when we simply provided a piece of fruit and a peanut butter sandwich, the test scores went up by a whopping 30%! It was a simple insight – none of us should take important tests if we can’t concentrate from being hungry. Harambee has made over 1.2 million peanut butter sandwiches (and counting!) as a result of this accidental iteration. 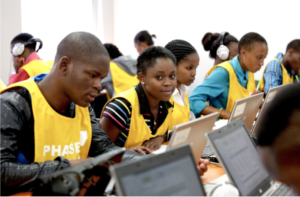 Harambee has taken these and other lessons learned to help 50,000 youth get their first job and build an active network of 450,000 work-seekers. We are now putting the power of iteration to the test as we adapt our model for establishment in Rwanda, a new geography. We are trying to learn as much as we can before we hire full-time staff or set up operations. The pilot plan calls for providing assessments and ‘work seeker support’ to 1,000 youth so that we can match them to available jobs. At our level of scale in South Africa, we could easily reach 1,000 youth in less than a week. But in Rwanda we are choosing to work with 250 youth per week, and only for one week of each month so that we can iterate anew every three weeks to make the changes, tweaks, and pivots necessary for meaningful impact. Even though we were geared up to kick off our pilot next month with the first group of 250, the Harambee itch to iterate led us to run two ‘pre-pilot days’ this month – one day with 10 youth and a second day with 30 youth. That was a good idea! Many of the interventions we planned for the pilot needed to change (the level of English comprehension was too low for our assessments) as well as many things we hadn’t even thought about (peanut butter sandwiches are not common in Rwanda so what snack do we serve)? It is a lot easier to fix, adapt, and get it right with 10 customers than it will be with 250, 1000, 10,000. So now we have three weeks to iterate, try again, fix for the next three weeks, and try again. We believe this will allow us to build a scalable solution for Rwanda more quickly than the traditional approach of building end-to-end operations and then trying to fix what doesn’t work. We are thinking big, but acting small – a key principle of Lean Impact. What we learned from 10 people will shape what we deliver to 1,000 people. And in a matter of a few short months. We already know that we need to slow down the many activities we had planned so that we deliver a clear value proposition that will make Rwandan youth (our customers) want to come back for more and also recommend us to their friends. We expect that this journey will be messy with plenty of unknowns. Because of our ‘pre-pilot’, the original budget and plan we developed is already out of date. We have to change what we promised our partners, funders, and team. Iteration, like friction, can generate heat. But it will also generate progress and impact. Harambee CEO Maryana Iskander, Head of Knowledge & Learning Rob Urquhart, and the Harambee Rwanda team for contributing to this piece. For many patients, just getting to their doctor’s appointments is an uphill battle. Medical or cost restrictions may make public transportation and ride sharing not a viable option. Nearly 4 million adults and children with chronic conditions miss or delay medical appointments each year, because they don’t have a ride. On the other side of the equation, hospitals often have a hard time finding quality transportation partners that are reliable. Many don’t follow instructions or provide a quality of care that meet the standards of the hospital. Entrepreneur Erica Plybeah saw this gap between the patients and the hospitals firsthand with her own type-2 diabetic grandmother, a double-leg amputee who used a wheelchair for the latter part of her life. Her main transportation was her daughter, Plybeah’s mom, who worked full-time and had a hard time getting her back and forth to doctor appointments. There was no access to other forms of transportation in their small town. Thanks to almost a decade in clinical IT, Plybeah gained experience finding technical solutions for hospitals and clinics. “As I worked with hospitals more, I’ve learned that transportation and how it affects the health of patients is a huge problem, not just in Memphis but across the country.” According to a new report, 20 percent of a patient’s health is linked directly to medical care, but social and economic factors account for another 40 percent, including nutrition, housing, education and access to transportation. Plybeah entered a medtech-focused pitch competition and, after hearing the direct feedback from hospital administrators, moved forward with creating cloud-based patient transportation solution MedHaul. “We’re helping eliminate transportation barriers for patients and poor and rural community. We are a platform that connects hospitals and clinics with quality transportation providers in their communities. We focus on providing rides for any type of patient regardless of their various needs,” says Plybeah. Currently, hospitals must go through their rolodex of transportation providers, leaving voicemails with each, until one of them is available to book the ride for the patient. The process is inefficient and often leads to sub-par patient care. “Hospitals usually just pick the first one that they see… then on the flip side, the transportation providers don’t have the accurate information because everything was a phone call,” Plybeah says. With MedHaul, caseworkers and nurses log on to the platform, add a patient’s basic demographics and caregiver information (for example, if they’re in a wheelchair or non-emergency stretcher) and the platform filters the top providers that fit that criteria. The chosen provider picks up the ride through the platform and receives details on the patient and an optimized route. The hospital, clinic or nursing home can track when the driver is on its way, similar to other ride sharing companies, and the caregiver gets updates from the patient for peace of mind. To screen providers, MedHaul looks through the Medicaid basic transportation standards in each state and adds a few criteria of their own to make sure they’re on boarding only the top providers in the area. The team makes an on-site visit to inspect the company’s vehicles and meet the staff after they reach out. Pending all approvals and insurance coverage, the provider can be live on the platform within a week. Ten years ago, I raised money with a PowerPoint presentation. Today, the expectations of investors are much higher. Investors want to see working products with paying customers before writing you a check. But what should you do if you’re a non-technical founder with no way of building your idea yourself? Recruit a team? Hire a freelancer? Beg friends and family for their savings? I was in your situation five years ago. Here’s the path I took: Five years after my first venture, I moved to San Francisco to pursue a new startup idea. I prepared my PowerPoint and went optimistically to investors. This time, the track record and pitch deck weren’t enough – they wanted to see a team, with a prototype. When I started looking for a technical co-founder, I quickly learned that competition was fierce. With new business resources available online, many technical founders wanted to work on their own startup ideas. So after months of fruitless networking and pitching, I took my fate into my own hands. If my vision was going to become a reality, I needed to learn how to create it myself. Over the last five years, it’s been my mission to acquire any creative skill that can help me build my businesses; coding, design, email marketing – you name it, I’ve learned how to do it. Wireframes are simplified versions of your product design, consisting of boxes, lines and simple text. I use Sketch to create wireframes. It’s easier to use than Photoshop, and if you can already use PowerPoint or Keynote, you’ll be fine. I transfer the finished designs to Invision in order to create a clickable prototype. Seeing how real people react to these basic designs helps me better understand customer needs. Once you get the hang of wireframing, it’s not a huge leap to add colors, fonts, and images to make the design more functional. I take inspiration from the design of other products and use resources like The Noun Project, Colour Lovers, and Unsplash to help me achieve a professional look. Then, I use Invision to get feedback on the visual designs and iterate from there. Can’t everyone write? Sadly, not. Good writing takes a lot of practice and there are lots of tricks of the trade – like using concrete nouns, active verbs, and vivid metaphors. On Writing Well by William Zinsser was the first book on writing that I read. I’ve since gobbled up many more, including those by the father of advertising, David Ogilvy. With a basic foundation in design, I was able to build my personal website in Wix, in just a couple of days. Today, you’re spoiled for choice when it comes to website builders, with Squarespace, Leadpages, Instapage – just choose one and learn it thoroughly. Building landing pages helps me validate new ideas, by seeing if people actually sign up. Email is easily the most undervalued skill in tech today. Think about it. Most businesses couldn’t survive without using email properly. We all write hundreds of emails a week, but email marketing is an art. The ability to cultivate a readership for your new business idea is extremely valuable. I use MailChimp – it’s cheap and covers the basics. When you start learning Spanish, you can’t use fancy words like ‘delectable’ to describe your fish taco. So you make do with ‘good.’ Similarly, you’ll need to simplify your solution, to something you can actually build. To find a simpler solution, first write out the need that your solution addresses. Next, brainstorm 15 different solutions that would also solve that need. Don’t worry about scalability . . . just keep going until you figure out a solution that you can build quickly. In other words, marry the problem – not the solution. If you want to win as a founder, you need to be able to create something. When money gets tight, founders who can’t create are more likely to get desperate and make bad decisions . . . like hiring the wrong person, or committing to a product that isn’t working. I also believe that learning creative skills makes you a better leader. It’s a humbling experience to see your design confuse users, or to get incisive critique on your copy, or to see your emails’ open rates. When you understand the struggle of creation from the inside, it will help you as you scale your business. Original article on Medium by Dave Bailey March 2019. One of the questions I get asked quite often, both at conferences and when coaching executives, is what type of personality is best suited for innovation so that they can optimize their hiring. Are technical people better than non-technical people? Introverts better than extroverts? Is it better to hire foxes or hedgehogs? The first thing I tell them is that there has been no definitive research that has found that any specific personality type contributes to innovation. In fact, in my research I have found that there is not even a particular kind of company. If you look at IBM, Google and Amazon, for example, you’ll find that they innovate very differently. The second thing I point out is that every business needs something different. For example, Steve Jobs once noted that since Apple had always built integrated products, it never learned how to partner as effectively as Microsoft and he wished it would have. So the best approach to hiring for innovation is to seek out those who can best add to the culture you already have. In Good to Great, author Jim Collins invokes Isaiah Berlin’s famous essay about foxes and hedgehogs to make a point about management. “The fox,” Berlin wrote, “knows many things, but the hedgehog knows one big thing.” Collins then devotes an entire chapter to explaining why hedgehogs perform better than foxes. Yet as Phil Rosenzweig points out in The Halo Effect, this is a highly questionable conclusion. Even if it were true that the most successful companies focus on one core skill or one core business, that doesn’t mean that focusing on “one big thing” will make you more successful. What it probably means is that by betting on just one thing you increase your chances of both success and failure. Think about what would have happened it Apple had said, “we’re going to focus just on computers” or if Amazon had focused on just books. There is also evidence, most notably from Philip Tetlock, that foxes outperform hedgehogs on certain tasks, like making judgments about future events. So the best strategy would probably be to hire a fox if you’re a hedgehog and to hire a hedgehog if you’re a fox. In other words, If you like to drill down and focus on just one thing, make sure you have people around that can help you integrate with other skills and perspectives. If you like to dabble around, make sure you have people who can drill down. We tend to see leaders as brash and outgoing, but my colleague at Inc, Jessica Stillman points out that introverts can also make great leaders. They tend to be better listeners, are often more focused and are better prepared than social butterflies are. Those are great qualities to look for when adding someone to add to your team. Still, you wouldn’t want to have an entire company made up of introverts and, in SocialPhysics, MIT’s Sandy Pentland explains why. Perhaps more than anything else, innovation needs combination. So it’s important to have people who can help you connect to other teams, both internally and externally, bring in new ideas and help take you in new directions. Consider Amazon, a company that is not only incredibly successful but also highly technically sophisticated. You might expect that it hires a lot of introverted engineers and I’m sure that’s true. Yet the skill it is most focused on is writing, because it understands that to create a successful product, you need to get a lot of diverse people to work together effectively. So much like with foxes and hedgehogs, if you’re an introvert you should make sure that you have extroverts that can help you connect and if you are an extrovert, make sure you have people who can focus and listen. Yet the story is not nearly as clear cut as Jobs makes it out to be. When IBM hit hard times it was Lou Gerstner, who spent his formative professional years as a management consultant, that turned it around. Steve Ballmer clearly made missteps as CEO of Microsoft, particularly in mobile, but also made the early investments in cloud technologyled to Microsoft’s comeback. So much like with foxes vs. hedgehogs and introverts vs. extroverts, the choice between technical and non-technical people is a false one. Far more important is how you build a culture in which people of varied skills and perspective can work closely together with a shared sense of purpose. Today, as we enter a new era of innovation, organizations will need a far more diverse set of skills than ever before and building a collaborative culture will be key to success. Over the past few decades, the digital revolution has shaped much of our thinking about how we advance a business. Digital technology required a relatively narrow set of skills, so hiring people adept at those skills was a high priority. Yet now, the digital era is endingand we need to rethink old assumptions. Over the next decade, new computing architectures like quantum and neuromorphiccomputing will rise to the fore. Other fields, such as genomics and materials science are entering transformative phases. Rather than living in a virtual world, we’ll be using bits to drive atoms in the physical world. That’s why today collaboration is becoming a real competitive advantage and we need to focus far less on specific skills and “types” and far more on getting people with diverse skills, backgrounds and perspectives to work together effectively. People say that ideas are a dime a dozen, but many entrepreneurs–even experienced ones–struggle to come up with promising product ideas. The fact that you have an idea that excites you is a great milestone, and even though the startup journey is long and arduous, you at least have got a ticket to the show now. However, starting to build your product at the outset can be extremely risky (unless you are working on a breakthrough platform technology such as blockchain or quantum computing). There is still a lot that you need to learn to refine your idea. The second most common reason for startups failing is that they run out of money, so one of the most critical things that you can do is be ruthlessly efficient. Turning your idea into a functional product is likely going to be the biggest resource drain in the very early stages of your company, so you absolutely can’t waste your resources building something that is not needed or wrong. Even if you are doing the engineering yourself, you don’t have infinite energy and time to sacrifice, and you too need to prevent wasting your efforts technical debt that you can easily avoid. So what exactly should you be doing? Learn everything there is to know about competing solutions. Far too often, aspiring entrepreneurs come to me thinking that they have an idea for a product that does not yet exist–an erroneous notion that is easily dispelled by a few minutes of Googling. Do not fool yourself into thinking that your idea is so unique that you don’t have competitors. 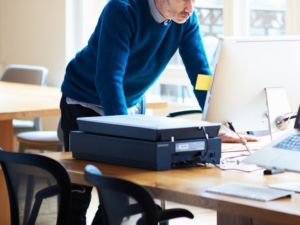 For your startup to succeed, your product needs to help customers accomplish their tasks much more effectively and easily than other solutions can. You need to know, in great detail, how other solutions succeed or fail because this knowledge will allow you to efficiently create something that is significantly better than status quo. It ought to be easy for most startups to come up with at least ten competing solutions and list ten things that they do well and another ten things that they do poorly. Your idea is going to help people do something better or more enjoyably than anything else that is available to them. However, success is in the details. Facebook certainly wasn’t the first social network, Slack wasn’t the first business communications app, and Apple didn’t create the first smartphone. It’s the little things that end up being decisive differentiators of your product, and the only way to get those right is to know your customers’ needs, preferences, and challenges in exacting detail. The most effective way to gain superior customer insight is through dialog with individuals rather than via impersonal surveys. Ideally, you should sit down with those that are likely to be your customers and probe about their task, challenges, wants, and needs. Also, few things are as informative as watching your target customers use competing products and providing their feedback on the experience. Learning from your customers in person has the significant advantage that you can see their emotional response to questions and as they describe using available solutions. It is sometimes exceedingly difficult to meet with your target customers in person, but rather than turning to a structured survey, you should still seek to talk with them to give yourself the flexibility to dive deeper into certain themes that might be of particular relevance to your innovation. Video conference and even a traditional phone call provide a channel for engaging discussion and incisive exploration. It may take a great deal of effort to overcome your aversion to a phone call, but I can almost guarantee that you’ll learn a lot more through a conversation than with the aid of a static survey. It may seem backwards to start with learning about your competition rather than your customer, but I’m assuming that you already have basic knowledge about the people for whom you are developing your product. Plus, I have found it to be more efficient to research your customer after you have gained a deep understanding about competing products because it’s usually much easier to do some virtual intelligence gathering than get busy people to talk to you about their needs. However, it’s certainly possible to first do a deep-dive on the customer and then investigate your competition. Doing things in this order simply means that you might have to have a second dialog to ask specific questions about competing solutions. As you learn more about your customers and how competing solutions meet and fail to meet their needs, you should be continuously refining your idea and how you promote it. Pitch your idea to your customers and listen to their feedback, which you can use to improve your innovation even if it is theoretical at this point. Plus, you can get meaningful reactions to your idea without even presenting a prototype. At the most basic level, you can describe how your product will be different from other options to get high-level feedback on the concept itself. Perhaps you’ll find that you are focusing on the wrong features. Delving deeper, you can present product designs, which articulate the specific implementation of your innovation. 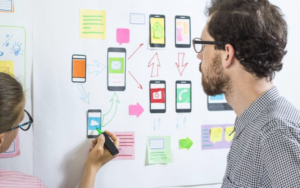 Designs will help folks more accurately visualize your product and will allow them to provide feedback on the user experience, form factor and anticipated implementation. Each round of feedback that you get will allow you to fine-tune your product in the design stage, so you are not wasting valuable time and resources in the engineering phase. Remember that the second most likely reason why you will fail is that you’ll run out of money, so efficiency is paramount at the earliest stages of your startup journey. Sell your product as a service. Even better than getting a reading on your product’s market potential is getting multiple data points or input on variations of your product. Let me explain. First, you can implement all four tactics and assess the resulting data as a whole so you don’t get false negatives. Perhaps one channel will be much more effective at reaching your target customer than the others. Second, you can pitch different versions of your product and see which one generates the greatest interest. Perhaps you can vary which features you highlight or swap our product designs. The more you can figure out before spending a lot of engineering resources the better. As I alluded to at the beginning of this article, the above advice is much more suited for a product that packages existing platform technologies in a novel product design rather than for fundamental platform technologies such as blockchain, machine learning, and 3D printing as well as performance-enhancing innovations such as edge computing. As one of my favorite innovation authors, Luis Perez-Breva, notes, the specific applications for such technologies may be both manifold and not immediately apparent requiring you to build a product with less competitor and customer research. While stationed in Bahrain with the Navy, married couple and business partners, Lisa and Justin Bey, often found themselves serving healthy and vegan food to their community. They turned to SBA’s resource partner network for guidance in turning their labor of love into a juice bar business. While stationed in Bahrain with the Navy, married couple and business partners, Lisa and Justin Bey, often found themselves serving healthy and vegan food to their community. They turned to SBA’s resource partner network for guidance in turning their labor of love into a juice bar business. They received business counseling from the Veterans Business Outreach Center (VBOC) in Norfolk, Virginia and their local branch of @score_mentors. With the help of the VBOC, the couple completed extensive market research and identified a small vacant storefront in a plaza near both a nutritional supplements store and an exercise studio. The Beys were also able to secure an SBA Express loan and a 7(a) loan to purchase furniture, fixtures and equipment. @alkaliciousjuice opened its doors in 2016, supplying the Chesapeake area with healthy smoothies, bowls and alkaline water. 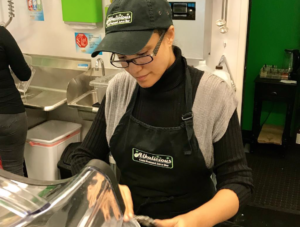 Alkalicious has become a fixture in their community, now serving markets from young military moms and millennials to health conscious 45-65 year olds.